I was a naughty girl this past weekend and did not bring sunscreen with me when we went for a hike (there may have been some beach time as well). Of course, every product I put on my face contains sunscreen, but as we all know it’s essential to reapply. And then there’s the problem of finding one that doesn’t leave my skin greasy, especially given my battle with oily skin. Well, I have found a solution for anyone that battles acne or the greasies. 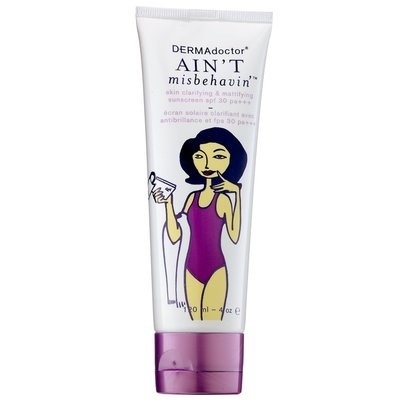 DERMAdoctor “Ain’t Misbehavin’ Skin Clarifying and Mattifying Broad Spectrum SPF 30” actually is the perfect sunscreen for those with less than perfect skin. This little beauty helps oily, combination, or blemish-prone skin from premature aging due to UV exposure. This will hydrate and protect skin without feeling greasy or sticky, which I am all about. Plus, it’s formulated with willow bark, a known clarifying agent. So, it can actually help prevent new blemishes from occurring and will help eliminate the ones you already have. The light texture absorbs instantly and is for the face or the body (another bonus for those with problematic back and chest areas). Just be sure to reapply every two hours if you’re outside. 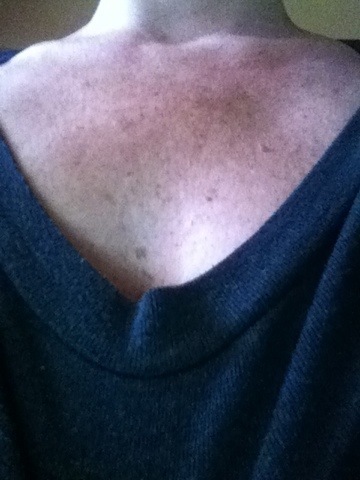 And just to prove how important sunscreen is to the younger people, here’s a picture (albeit a weird one) of my chest. I didn’t have freckles growing up-this is all sun damage. We didn’t know about or use sunscreen in the 70’s and 80’s, and this is the result. Sunscreen is vitally important! You don’t want a freckle chest when your 40+. Nothing ages you more! Well, you did grow up with me! Baby oil baby!! Everytime I stay in the sun too long I get beauty spot/freckles. Those really dark brown ones that just appear on their lonesome in random places. I even got on on the inside of my finger randomly enough! I have oily skin so I am a big fan of oil-free sunscreens! If only Sephora delivered to Australia! I know exactly what you’re talking about. My mom once thought I had the “pregnancy mask” but it was actually a gigantic sunspot on my face. You could google “dermadoctor” and see if there’s a place that carries it in Australia. Good luck!